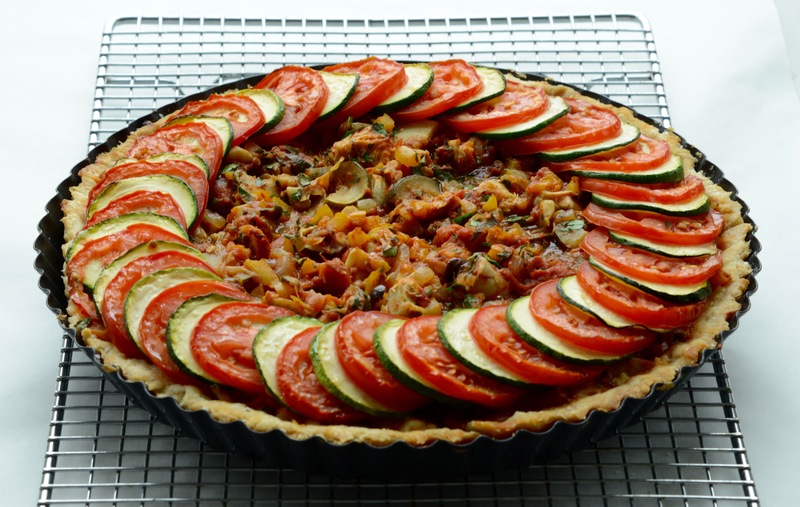 This lovely tart is a simplified version of my Ratatouille Pie recipe, featured in British Columbia From Scratch. It’s a great company dish because it can be made well in advance and heated just before serving. To keep the pastry crisp, I pre-bake the pie shell before adding the filling. I dust the pastry shell with Parmesan cheese just before baking the empty pie shell. This forms a light seal and prevents the filling from seeping through. If you’re not in the mood for making pastry, the ratatouille filling is delicious tossed with pasta, gnocchi, rice, or baked potatoes. Heat 1 Tbsp oil in a large saucepan, add the onions, and cook over medium heat for about 5 minutes until translucent. Add the zucchini, red peppers, and salt; cook until just tender, about 5 minutes. Add the garlic and stir for about half a minute until aromatic, then add the tomatoes, breaking them up with a wooden spoon. Add the artichokes, pitted olives, hot sauce, and herbs. Simmer uncovered over medium heat, until the liquid has completely evaporated and the mixture has thickened, about 15–20 minutes. (A watery mixture will seep through the pastry.) Taste and season with additional salt if desired. Set aside to cool completely. Combine the strained ricotta, feta, Parmesan, and egg in a medium bowl and mix well. Spread the cheese mixture evenly over the base of the pastry-lined tart pan. Spread the cooled ratatouille filling over the cheese mixture. 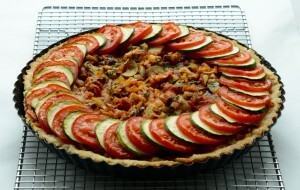 If desired, place alternate slices of zucchini and tomato around the perimeter of each tart. Brush the sliced tomatoes and zucchini with a little oil and sprinkle with a bit of kosher salt. Place the tarts on a baking sheet and bake in the preheated oven for about 30 – 40 minutes. In a measuring jug with a spout, combine the egg, vinegar, and enough ice water to equal 1 cup; mix with a fork. Gradually pour about half the liquid into the flour and mix with a fork, adding only enough additional water to make the dough cling together in an untidy mass. You won’t use all the water; you’ll have anywhere from ¼ – ½ cup leftover. Using your fluted tart pan as a guide, cut the dough about an inch wider than the pan. Line the mold with the pastry and trim the edges. Bake the pie in a 375 F preheated oven for about 10 minutes, then remove the foil. Sprinkle with the grated Parmesan cheese. Continue to bake until completely cooked, about 20 minutes in total.